PITTSBURGH, PA — (Marketwire) — 10/29/09 — Quantapoint (http://www.quantapoint.com) — recent recipient of a General Services Administration (GSA) laser scanning IDIQ contract — announced the integration of Quantapoint 3D laser scan data with Autodesk® Revit using QuantaCAD(TM). Laser data may be accessed directly within Revit as photo-realistic Laser Images(TM) of individual 3D laser scans and high-definition Laser Models(TM) of integrated laser data, not fuzzy “point clouds” whose sparse measurements make them difficult to use and understand. Laser Models for direct remodeling or to create new designs. Laser Image Projection: Project 3D BIM models into Laser Images of individual 3D laser scans for real-time validation or design reviews. Measurement: Measure points, distances and mechanical or plumbing pipe information between the 3D BIM model, Laser Images and Laser Models. Clashing: Clash laser data and 3D BIM models to verify remodeling accuracy or identify interferences with new designs. Demolition: Group Laser Models that are parts of the facility being demolished and highlight or hide them for planning or design analysis. Multi-user Database: Share measurements across the team via a multi- user database to ensure consistent information and easier interactions. Images and views) to focus on areas or interest and more quickly resume work. If you are interested in finding out more about accessing laser data in Revit using QuantaCAD or would like a demonstration, visitwww.quantapoint.com/qp/contact or e-mail info@quantapoint.com. Quantapoint uses patented laser scanning technology to create a high-resolution Digitized Facility(TM) of Laser Models(TM) (not “point clouds”) and Laser Images(TM) that can be accessed directly, within various CAD packages or integrated with facility and asset information. By putting critical facility as-built information at our client’s fingertips, Quantapoint has helped them reduce costs, optimize schedules, increase quality and improve safety. For more information on our technology and services, please visit www.quantapoint.com, e-mail info@quantapoint.com or call +1-412-653-0100. Ottawa, Canada, Wednesday, October 28, 2009 – Ambercore is pleased to announce its point cloud technology has been incorporated into the release of AutoCAD® Civil 3D® 2010 and AutoCAD® Map 3D 2010, part of Autodesk’s Subscription Advantage Packs. These releases are the first products from Autodesk that incorporate Ambercore’s technology which provides valuable new functionality for importing and visualizing large point cloud data sets. Point clouds are extremely large data sets with millions of points, and are typically created through the use of laser scanning, high-definition surveying, or LiDAR (Light Detection and Ranging). They provide accurate representations of existing conditions of terrain surfaces, roadways, bridges, and the interior or exterior of features of buildings. Some common uses of LiDAR data in AutoCAD® Civil 3D® and AutoCAD® Map 3D include using the point cloud data to create DEMs and contour data, digitizing as-built features for design projects, visualizing power lines and surrounding vegetation for right-of-way management, and developing an understanding of the site context in site surveys. The Ambercore point cloud technology within the AutoCAD® Civil 3D® 2010 and AutoCAD® Map 3D 2010 products enables customers to read, store, index, and quickly retrieve the extremely large point cloud data sets associated with laser scanning and LiDAR. As a result, customers are able to visualize and analyze data in 3D and better build high-precision 3D models. Ambercore is the 4D Company. We make innovative mobile LiDAR technology, we provide LiDAR data collection services, and integrate and extract knowledge from 4D data. Ambercore’s 4D-iQ provides enterprise-scale software and service solutions for Energy, Mining and natural resource sectors. With its powerful spatial modeling and simulation software, 4D-iQ helps clients make important business decisions by collecting, integrating and analyzing spatial information in 2D, 3D and in 4D (over time). TITAN® is a revolutionary technology that produces high accuracy survey and mapping products for corridor and infrastructure projects across a number of vertical markets. Travelling at highway speeds – or on rail or vessel – the system uses state-of-the-art LiDAR, imaging and positioning technology to provide feature rich 3-dimensional data, from which intelligent information is extracted and delivered to clients. TITAN® has been deployed on projects throughout the world since 2003. Ambercore’s Terrapoint Division has provided LiDAR and other digital mapping services for a diverse clientele in over forty countries for the past twenty years. Terrapoint’s primary focus is to find solutions that fit client needs, and to continue a reputation for meeting and exceeding client demands in the delivery of digital elevation and image data. Service and product offerings include complete airborne LiDAR, and digital imaging for engineering, survey and mapping applications. Terrapoint is considered a leader in aerial LiDAR services, and owns one of the largest fleets of sensors in the world. Best of breed solutions comprised of software, hardware and services have been deployed internationally with tier-one clients. Ambercore is headquartered in Ottawa, Canada with offices in Houston, Calgary, South Africa and Europe. Clash grouping and detection – Autodesk Navisworks combines precise faultfinding with hard, soft, clearance, and time-based clash management. Engineers can more quickly review and cross-check geometry created by most 3D authoring software; maintain a complete record of all clashes found throughout a project; check time and space coordination; and resolve site and workflow issues at the planning stage. Multi-format support – Compatible with most major 3D design and laser scan formats, Autodesk Navisworks can combine 3D data from multiple formats, regardless of file size, into a comprehensive, dynamic information model, which can be shared with all stakeholders. Autodesk is committed to providing multi-format support and will work to provide compatibility with new file formats as they emerge. Collaboration – Autodesk Navisworks enables design teams across engineering disciplines to view, annotate, expand, revise, and analyze one comprehensive information model for informed, timely decision-making. All project review files saved in Navisworks format are compressed, more secure, and streamable, and can be easily viewed with the free* Navisworks viewer. 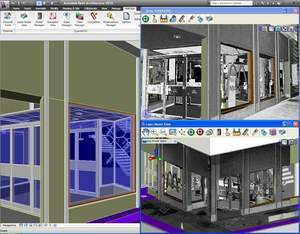 For more information and a free* trial version of Autodesk Navisworks software, please visit http://www.autodesk.com/navisworks-plant. Autodesk, Inc., is a world leader in 2D and 3D design and engineering software for the manufacturing, building and engineering, and media and entertainment markets. Since its introduction of AutoCAD software in 1982, Autodesk has developed the broadest portfolio of state-of-the-art Digital Prototyping solutions to help customers experience their ideas before they are real. Fortune 1000 companies rely on Autodesk for the tools to visualize, simulate, and analyze real-world performance early in the design process to save time and money, enhance quality, and foster innovation. For additional information about Autodesk, visit http://www.autodesk.com/. This is old news, but it is worth posting here for users thinking about purchasing point cloud software in the near future. it into future releases of Autodesk software. Point clouds are extremely large data files usually created through the use of laser scanning, high definition surveying, or LIDAR (Light Detection and Ranging). They provide a more accurate representation of existing conditions whether of a terrain surface or urban center, a roadway or bridge, or the interior/exterior of a building. • Local government, utility and telecommunications customers will be able to maximize the return on their investment in large-scale LIDAR mapping and infrastructure projects. • AEC customers will experience the power of Building Information Modeling (BIM) earlier in the project lifecycle. By providing the capability to incorporate highly accurate LIDAR data into the design process, we will provide a foundation for creating more accurate designs faster. This will be particularly beneficial to our civil engineering customers involved in road and highway design. Autodesk, Inc. is the world leader in 2D and 3D design software for the manufacturing, building and construction, and media and entertainment markets. Since its introduction of AutoCAD software in 1982, Autodesk has developed the broadest portfolio of state-of-the-art digital prototyping solutions to help customers experience their ideas before they are real. Fortune 1000 companies rely on Autodesk for the tools to visualize, simulate and analyze real-world performance early in the design process to save time and money, enhance quality and foster innovation. For additional information about Autodesk, visit http://www.autodesk.com. Ambercore, Terrapoint, and TITAN are registered trademarks or trademarks of Ambercore Software Inc., and/or its subsidiaries and/or affiliates, in the USA and/or other countries. All other brand names, product names, or trademarks belong to their respective holders. Ambercore reserves the right to alter product offerings and specifications at any time without notice, and is not responsible for typographical or graphical errors that may appear in this document. Autodesk and AutoCAD are registered trademarks or trademarks of Autodesk, Inc., and/or its subsidiaries and/or affiliates, in the USA and/or other countries.